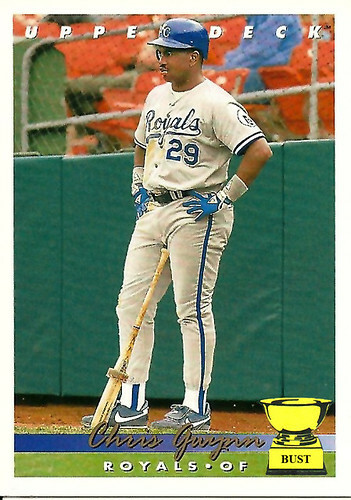 Chris Gwynn's stream of consciousness, 1:14 to 1:16 p.m. May 14, 1992: "Man, where can I put this bat? On my shoulder? No, that's uncomfortable. In my hands? No, that looks awkward. Should I lay it on the field? No, that's disrespectful. Where to put it. Where to put it. What about right here, nestled in my groin. Ooh, yeah. That feels great. And I bet I look pretty masculine. Ooh, yeah. I'll have to tell the wife about this one. I wonder if Dad ever hung out in the on-deck circle like this. I said "hung out." Ha, ha. Ooh, baby. This is nice. What if I shift my weight to the left a bit? Oooooooh, that's the ticket. Why is the pitcher looking at me funny? Who cares. I'm taking this bat out to dinner tonight."